The North Carolina Champion Big Tree Program, part of the NC Forest Service, keeps a database of champion trees organized by species and county. The tallest champion tree in North Carolina is what type of pine, standing 180 feet tall in Jackson County? There are currently nearly 400 champion trees registered by the NC Forest Service. What western county has more of these trees — around 60 — than anywhere else in the state? Our top champion tree in terms of canopy size has branches that spread 126 feet. This majestic specimen is a willow oak located in what Sampson County town? 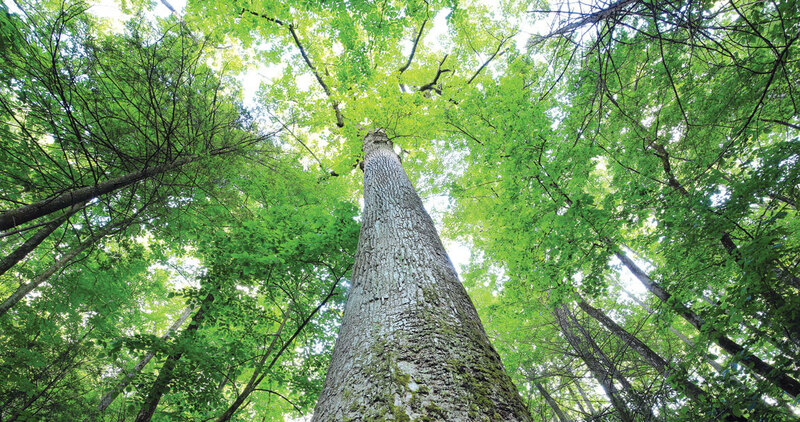 Bertie County has a yellow poplar near Powellsville that stands 146 feet tall with a circumference of 260 inches. The yellow poplar also goes by what name? Trunk circumference is generally measured in inches at a point about 4.5 feet above the ground. The champion tree with the largest circumference in our state is a 468-inch bald cypress on Conoho Creek, near Williamston, in what county? North Carolina no longer accepts new non-native species on the champion tree list, but some have been grandfathered in, including an ailanthus, also known as a “tree of heaven.” This 92-foot-tall specimen is located in Hillsborough in what county? The God’s Acre cemetery in Winston-Salem is the site of a champion ginkgo biloba tree. The ginkgo is native to China, but this particular example is located in what historic district? Fraser firs form the backbone of our state’s Christmas tree industry. A 100-foot-tall fir can be found on the grounds of High Hampton Resort in what Jackson County town? The common persimmon produces what is often called the “fruit of the gods.” Our state’s champion with the greatest circumference is near the town of South Mills, in what state park?